Water is vital. Life on earth would be impossible without water. But water can also be life-threatening. Consider the destructive power of rivers which burst their banks, or polluted drinking water sources. The MSc Water Management track focuses on understanding natural surface and groundwater streams and on managing, controlling and using water streams for society. This covers both ground and surface water, as well as rainfall and for example waste water. Water Management also considers not just the quantity of water, but the quality of ground and surface water. Considerable attention in this track is devoted to modelling, laboratory work, fieldwork and research with test installations. The urban water engineering specialisation focuses on water management in the built-up environment. You learn about drinking water supply, wastewater treatment, types of sewer systems, urban flooding and urban groundwater management. You are taught the theoretical backgrounds, how to model urban water management systems, and how to design them yourselves. Further subjects include the operation and maintenance and replacement. The Hydrology specialisation focuses on describing and quantifying surface water and ground water systems. As a hydrologist you examine the availability of water and the effects of water removal and artificial supplementing of ground water on nature and the environment. You predict high and low river discharges with the help of precipitation and discharge models and calculate which discharge levels can lead to problems. You also investigate the effects of ground water policy, such as flooding and the drying up of water flows, and you study how the transport of undesirable substances in water takes place and how to mitigate the negative effects of these substances on the water quality. A further subject is water quantity management, which focuses on the interaction between ground water and surface water. In the first component you concentrate on making and keeping sites suitable for human habitation. Urban planning and technical aspects of water management play an important role here. 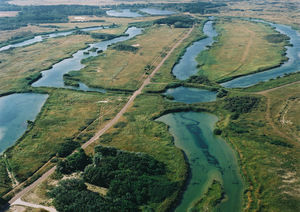 The second component relates to the design and management of polders and systems for flood protection, together with the accompanying operational control and management organisation. In the third component you concentrate on good management of water supply and discharge and of the water quality. If you select the fourth component then you learn all about the dynamic management of water flows, water levels and water quality with the help of automated measuring and control techniques. In the fifth component you study the physical, chemical and biological components of a water catchment area in relation to the surroundings. Many of the Water management courses can be followed in the form of distance learning. “Distance courses” are given parallel to the on Campus version of that course, ending with Exams together with the on Campus students. If you only want to expand or update your knowledge through (online) education, you can follow individual courses as a “contract student”. Participants will receive a certificate for each course after completion. The outlook for graduates in the labour market is good, both in the Netherlands and abroad. Most set to work as advisors, designers or project leaders and take up careers with advisory and engineering bureaus, water boards, drinking water companies, research institutes, universities, the Ministry of Waterways and Public Works, other ministries, provinces, municipalities or organisations for development aid. Want to know more about the Department, visit the website of the department of Water Management.